When we talk about piano playing, it comprises of a number of different elements that makes you an expert or at least a good pianist. Many of us can play piano well but we wish to gain more speed for our fingers over piano without affecting the accuracy and fluidity of music. The idea behind gaining this skill is to train your body and mind to work together focused on a single action. Learning to play piano needs you to first train your mind and get all the other thoughts cleared out. Clearing mind is important as it is our brain only that instructs our body and thus fingers to move over piano. Brain is the place where other dynamics such as speed, pressure and others are controlled. Set a target for yourself, get your mind focused and follow some tips and exercises that we have shared in order to gain improvement on finger’s speed. Techniques to work on Fingers’ Speed! Fingers Placement and Posture: One of the most important aspects that helps in improving your finger speed over piano is to have your fingers placed properly. For effective learning and play, fingers should be laid in the form of a spider. It works well all across your piano. Not only this placement would give you speed but it would also enhance feel of play and would help you improve. Moreover make sure that you maintain a good posture with your back straight rather than leaning towards piano. A good body posture would also help you in playing piano quicker even with difficult pieces. Have a Piano with Weighted Keys: For light keyboards or pianos, you will find it easier to increase your speed. However if you are used to of playing over light piano you will find it difficult to play on heavy keys. It is best to opt for a digital piano with weighted heavy keys in order to get used to of playing it with speed. With practice you will settle well with these keys and can gradually increase your speed too. Practice with Consistency: Regular practicing is the best way for improvement. Make sure that you follow a regular piano practicing schedule and during practice session try to make use of all the fingers of your hands. You may have noticed that some fingers such as your fourth and fifth one move slowly in comparison to others. Try to strengthen all the finger movements in order to play properly. Practice with Common Notes: Practicing with pieces and notes that you commonly play would give you more confidence. 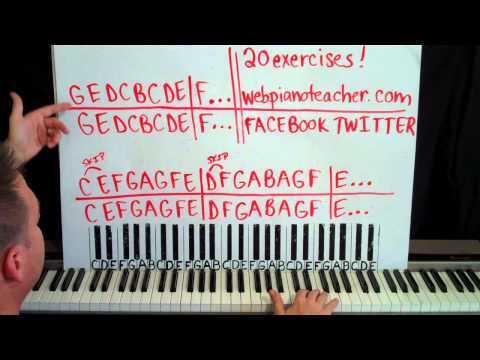 Repeatedly practice such pieces in order to get fluency with your fingers all across the keyboard. Practice Difficult Ones More: You may be able to play the pieces that you know effortlessly with speed but it would be harder with notes that you are not familiar with. Practice difficult phrases more and do a lot of practice in order to learn well. Once you have mastered your finger movements and speed over difficult ones, you will find playing common ones even much easier. Finger Exercises: Strength and speed of fingers can be improved with varied exercises of fingers. Apart from practicing over piano, you should also follow some fingers exercises in order to have consistent strength in all the fingers for gradual increasing of speed. C Major: You can start this exercise with either your right or left hand (your choice). Exercise begins with first five scale notes with the use of all the five fingers of one hand. You will begin with C till G and then back again. Begin with a moderate speed that you are comfortable with and make sure that you are playing all the notes with same strength so they give same amount of sound. Movements should be steady and controlled. Follow a straight motion. F Major: Another one is a full scale finger exercise where you play major F scale beginning with one octave and trying to play up and down with a slow speed in a steady and even manner. Slowly and gradually increase your speed. Arpeggios: This one is another effective finger exercise where you get to play chord notes individually rather than playing them all at once. Choose a chord and play its notes and then move your way up through your piano keyboard and exercise with higher octaves. Using Metronome: It would be best to use a metronome for these exercises in order to monitor your improvement. Begin at a slow pace and gradually increase pace so that you develop a strong finger speed with proper understanding of timings with varied musical notes. This would give you a proper method of screening your improvement. No matter what methods you use for practicing and strengthening your fingers speed, you should always begin at a slow pace and gradually increase speed in order to remain in good habits of playing properly. For improvement of your fingers speed over piano, you would also need to work out on your muscle memory and brain training. Make sure that your mind is focused for learning during practice and exercise sessions. For playing notes faster, you will need to train your mind to focus completely on notes.